Why did my very expensive gut string break when I wasn’t even using it? You open your tennis bag; pull out your favorite racquet, and…what the heck, (or something like that)! Natural gut is still considered the best of all string materials and performs beautifully in most racquets. However, natural gut is pretty expensive at about $70.00 per set, installed. So, it makes sense that one would like for it to last a long, long time, and, of course play well for that entire time. 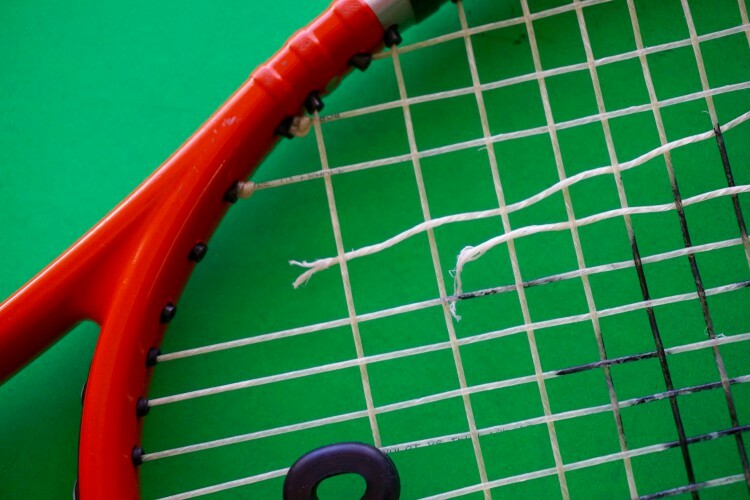 The perfect failure is when the string breaks around the middle of the string bed, then, why, when you pull the racquet out of the bag, the string is broken at the top and/or bottom! If you look at this failure you will, or should, notice where the string breaks. The first reaction is “the grommets are bad”. This is not the case here. But why does this happen? We need to understand a little about the racquet instead of the string right now. The strongest, and stiffest, portion of the racquet is where the throat piece joins the head shape. When the string is installed in this area it is “tighter” than the other strings. That is number 1. Number 2 is that natural gut string “moves”, actually contracts and relaxes, quite a bit, naturally. When natural gut moves, especially in this area, at the top and bottom, a lot of stress is caused at the bending points, which can contribute to the failure! So, the string in that area is stretching and relaxing over and over again until it cannot endure and simply breaks! So, what can you do to mitigate this failure mode? Avoid huge and sudden temperature changes. Posted on October 21, 2015, in Learning, Racquets, String, Tips. Bookmark the permalink. Leave a comment.